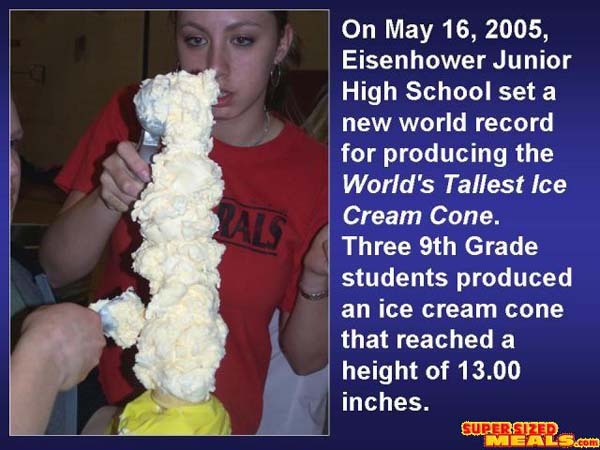 On May 16, 2005, Eisenhower Junior High School set a new world record for producing the World's Tallest Ice Cream Cone. Three 9th Grade students produced an ice cream cone that reached a height of 13.00 inches. This record has now been accepted by World Records for Schools and Mormon World Records. For more information on this event, see the newspaper article "Here's the Scoop: Kids Aiming High," that appeared in the May 15, 2005, edition of the Deseret Morning News of Salt Lake City, Utah, USA. 2) At no time during the event can any member of the three-person team handle or touch the ice cream. Only two scoopers or spoons can be used to transfer or manipulate the ice cream. (This rule is not violated if ice cream drips on a team member during the record attempt. Also, no knives or similar devices can be used to cut up the ice cream into blocks or chunks, and no such blocks or chunks of ice cream can be placed on the cone. 3) The ice cream used must be commercially made (not homemade) vanilla and/or chocolate, and must remain in a frozen state in a freezer until five minutes before the record attempt begins. The entire record attempt must take place in an area/facility where the air temperature is constantly 68ÂºF / 20ÂºC or higher. 5) The height of the ice cream cone must be determined by independent judges who determine the height of the ice cream cone--within an eighth of an inch (one-eighth of an inch is equal to 0.3175 centimeter)--by measuring the distance between the top of the ice cream cone and the top of the tallest layer of ice cream sitting on the cone.